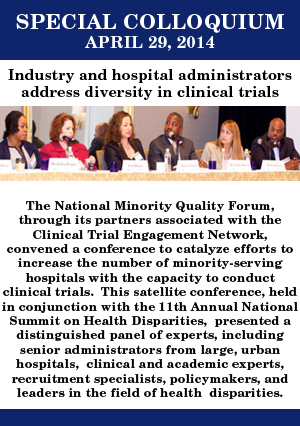 Thank you for visiting the website for the Clinical Trial Engagement Network, which is operated by the National Minority Quality Forum, Inc. (the “Forum,” “we,” or “us”). This site includes publicly available content pertaining to clinical trials (the “Network Public Site”), as well as an interactive database (the “Network”) that is available only to organizations that have entered into a separate agreement with the Forum (“Network Members”). The Network is an internet-based environment that connects patients, clinical trial sponsors, clinical investigators, health care professionals, their institutions, and advocacy organizations across the nation. THESE TERMS CONTAIN DISCLAIMERS OF WARRANTIES (SECTION 9), DISCLAIMERS OF LIABILITY AND AN EXCLUSIVE REMEDY (SECTION 10), AS WELL AS INFORMATION ABOUT CERTAIN LimitationS ON YOUR ABILITY TO Bring A Claim AGAINST US (SECTION 15). The Services are designed to comply with laws and regulations of the United States (the “U.S.”). Although accessible by others, the Services are intended for access and use by U.S. residents only. We make no representation that the Services are appropriate for use in any other jurisdiction. If you choose to access the Services from other locations, you do so on your own initiative and are responsible for compliance with applicable local laws and regulations. The Services offered you are general health-related information for educational and informational purposes only. The Services are not intended to replace personal consultation with a qualified medical professional. We are not engaged in rendering medical or similar professional services or advice via the Services, and the information provided is not a substitute for the professional judgment of a health care professional in diagnosing and treating patients. Your reliance upon any content or information provided through the Services is solely at your own risk. You should always seek the advice of a medical professional for questions related to any particular disease, disease symptoms, treatment, or participation in a clinical trial. You should not construe our publication of this content as an endorsement of the views expressed herein by the Forum, or any warranty or guarantee of any strategy, recommendation, treatment, action, clinical trial, or the availability of a clinical trial that meets your needs or interests. Engage in any other conduct that restricts or inhibits any person from using or enjoying the Services, or that, in our sole judgment, exposes either us or any of our affiliates, users or any other third party to any liability, damages, or detriment of any type. All content, information, materials, computer code, and software that is part of the Services (collectively, the “Content”) is the property of the Forum or third parties. You may access, use and display the Services on a single computer or device and download and print copies of the Content only to learn more information about or facilitate participation in clinical trials, without modification or alteration in any way, and only so long as you comply with these Terms. You may access, use and display the Services on a single computer or device and download and print copies of the Content only to learn more information about or facilitate participation in clinical trials, unless you are a licensed health care provider (such as a physician or health care facility), clinical trial sponsor, clinical trial investigator, related advocacy organization, and or a representative of one of the foregoing. Such entities and individuals may also use Content in connection with their professional duties to promote and facilitate increased participation in clinical trials among underrepresented populations. Copyright and Other Intellectual Property Rights. The Content is protected under the copyright laws of the United States and other countries. You acknowledge that all copyrights and other intellectual property rights in the Services are owned by the Forum or third-party licensors to the full extent permitted under the United States Copyright Act and all international copyright laws and all other applicable laws. Unless expressly permitted by an authorized person in writing, you may not copy, reproduce, distribute, publish, enter into a database, display, perform, modify, create derivative works from, transmit, or in any way use or exploit any part of the Content except that you may make use of the Content to learn more information about or facilitate participation in clinical trials, provided that you maintain all copyright and other notices posted along with the Content. To obtain written consent to use a copyrighted work, please contact the Forum using the information in Section 17. Copying or downloading these materials for any commercial use is a violation of these Terms. Notwithstanding the foregoing, licensed health care providers (such as physicians, health care facilities, and pharmacies), clinical trial sponsors, clinical trial investigators, related advocacy organizations, and their representatives also may use Content in connection with their professional duties to promote and facilitate increased participation in clinical trials among underrepresented populations. Trade and Service Marks. All rights in product names, the “I’m In” and Clinical Trial Engagement Network names, and related trade names, logos, service marks, trade dress, slogans, product packaging, and designs of “I’m In” and Clinical Trial Engagement Network products or services, whether or not appearing in large print or with the trademark symbol, belong exclusively to the Forum or third parties and are protected from reproduction, imitation, dilution, or confusing or misleading uses under national and international trademark and copyright laws. The use or misuse of these trademarks or any materials, except as permitted herein, is expressly prohibited, and nothing stated or implied on the Services confers on you any license or right under any patent or trademark of the Forum, their affiliates, or any third party. To obtain written permission to use the “I’m In” or Clinical Trial Engagement Network trade and service mark rights, please contact the Forum using the information in Section 17. We may change or terminate these Terms for any reason at any time. We reserve the right, in our sole discretion, to restrict, suspend, or terminate your access to and use of the Services, with or without prior notice. Otherwise applicable sections of the Terms shall survive termination. We also reserve the right to seek all remedies available at law and in equity for violations of these Terms. Upon termination, you must cease all use of the Services, including any use of the Content. YOUR USE OF THE SERVICES IS entirely AT YOUR OWN RISK. WE MAKE NO REPRESENTATIONS OR WARRANTIES ABOUT THE services, INCLUDING WITHOUT LIMITATION THE OPERATION OF THE SERVICES OR THE INFORMATION, MATERIALS, GOODS, OR SERVICES APPEARING OR OFFERED ON THE SERVICES or With ReSPECT TO any websites or services linked from the services. THE SERVICES ARE PROVIDED “AS IS”, “with all faults,” AND “AS AVAILABLE.” Without limiting the generality of the foregoing, WE DISCLAIM ALL WARRANTIES, EXPRESS, STATUTORY OR IMPLIED, INCLUDING BUT NOT LIMITED TO (I) THE WARRANTIES OF MERCHANTABILITY, FITNESS FOR A PARTICULAR PURPOSE, WORKMANLIKE EFFORT, TITLE, QUIET ENJOYMENT, no liens and no encumbrances; (II) THE warranties against infringement, misappropriation or violation of any intellectual property or proprietary rights of any person; (III) WARRANTIES ARISING THROUGH COURSE OF DEALING OR USAGE IN TRADE; AND (IV) THE warranties relating to the accuracy, reliability, correctness, or completeness of data or content made available on the SERVICES or otherwise by US. Further, there is no warranty that the SERVICES will meet your needs or requirements or the needs or requirements of any other person OR THE NEEDS OR REQUIREMENTS SET FORTH IN ANY DOCUMENTATION. WE MAKE NO WARRANTIES, EXPRESS, STATUTORY OR IMPLIED, THAT THE SERVICES, INCLUDING WITHOUT LIMITATION THE content, FUNCTIONS OR MATERIALS CONTAINED THEREIN, WILL BE TIMELY, SECURE, ACCURATE, ERROR-FREE, COMPLETE, UP-TO-DATE, FREE OF VIRUSES, OR UNINTERRUPTED. WE DO NOT NECESSARILY ENDORSE, SUPPORT, SANCTION, ENCOURAGE OR AGREE WITH ANY CONTENT, AND WE EXPRESSLY DISCLAIM ANY AND ALL REPRESENTATIONS, WARRANTIES AND LIABILITIES IN CONNECTION WITH ANY CONTENT. WE MAKE NO REPRESENTATIONS OR WARRANTIES THAT THE SERVICES WILL SUCCESSFULLY FACILITATE PARTICIPATION IN ANY CLINICAL TRIAL. WE make no representation that the Services are appropriate or available for use outside of the United States. no oral or written information made available by or on behalf of the Forum shall create any warranty. YOUR SOLE AND EXCLUSIVE REMEDY IS TO STOP USING THE SERVICES. UNDER NO CIRCUMSTANCES, INCLUDING WITHOUT LIMITATION NEGLIGENCE, WILL THE FORUM, OUR affiliates, or any party involved in creating, producing, or delivering the SERVICES BE LIABLE FOR DAMAGES OR LOSSES INCLUDING WITHOUT LIMITATION direct, incidental, consequential, indirect, special, or punitive damages AND LOST PROFITS arising out of THE TERMS OR your access, use, misuse, or inability to use the services, INCLUDING WITHOUT LIMITATION ANY CONTENT, or any Sites LINKED FROM THE SERVICES, HOWEVER CAUSED, WHETHER IN CONTRACT, TORT, NEGLIGENCE, STRICT LIABILITY OR OTHERWISE, EVEN IF THE FORUM HAS BEEN ADVISED OF THE POSSIBILITY OF SUCH DAMAGES, or in connection with any failure of performance, error, omission, interruption, defect, delay in operation or transmission, computer virus, or line or system failure. You agree to indemnify, hold harmless, and defend the Forum and its affiliates and licensors, and each of their respective officers, directors, contractors, agents, employees, successors and assigns, from and against any and all demands, claims, damages, liabilities, judgments, fines, interest, penalties, losses, costs, expenses and harms, including without limitation reasonable attorneys’ fees and fees of other professional advisers, arising out of or in connection with (i) your use of the Services (including, without limitation, your use of any Content), (ii) your online conduct, (iii) your violation or breach of these Terms, (iv) your failure to comply with any applicable laws or regulations, (v) your negligence, willful misconduct, or violations of the intellectual property or other rights of any person, or (vi) any of your dealings or transactions with other persons resulting from use of the Services. You shall not settle any such claim without our prior written consent. We reserve the right to assume the exclusive defense of any claim for which we are entitled to indemnification under this Section. In such event, you shall provide us with such cooperation as is reasonably requested by us. These obligations will survive any termination of these Terms. These Terms are governed by, and must be construed in accordance with, the laws of the United States and the State of New York, as applicable, without giving effect to their principles of conflicts of law. By using the Services, you waive any claims that may arise under the laws of other states, countries, territories or jurisdictions. Any proceedings to resolve or litigate any dispute in any forum will be conducted solely on an individual basis. Neither you nor we will seek to have any dispute heard as a class action or in any other proceeding in which either party acts or proposes to act in a representative capacity. No arbitration or proceeding will be combined with another without the prior written consent of all parties to all affected arbitrations or proceedings. We and you agree that all disputes arising under these Terms that cannot be settled through informal negotiation will be settled exclusively through confidential binding arbitration in accordance with the commercial rules of arbitration of the American Arbitration Association in New York, New York. The arbitrator’s award shall be binding and may be entered as a judgment in a court of competent jurisdiction. You agree that the Forum may seek any interim or preliminary relief from a court of competent jurisdiction in New York, New York, necessary to protect their rights or property pending the completion of arbitration. In connection with your use of the Services, you may be asked to consent to policies or terms and conditions in addition to these Terms. Please read these supplemental policies and terms carefully before making any use of such portions of the Services. Any supplemental terms will not vary or replace these Terms regarding any use of the Services, unless otherwise expressly stated. If you become a Network Member, you will be required to enter into a separate agreement with us (“Network Member Agreement”). To the extent that there is a conflict between these Terms and the terms of that Network Member Agreement, the Network Member Agreement will govern. Please direct any questions, complaints or claims related to the Services or your use of the Services, or requests to use a copyrighted work or trade or service mark right to support@joinimin.org.